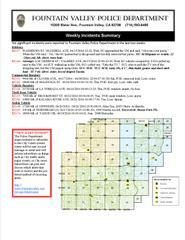 The Weekly Incidents Summary are events reported to the Fountain Valley Police Department. Events include Robbery, Residential, Vehicle Burglaries, Theft from Vehicles and Stolen Vehicles. An alert and well-informed public makes you less of a target to a criminal. Remember to call the Fountain Valley Police Department if you see something that is suspicious.